These days, I’m working in partnership with my Affiliates to serve collaborations change initiatives. 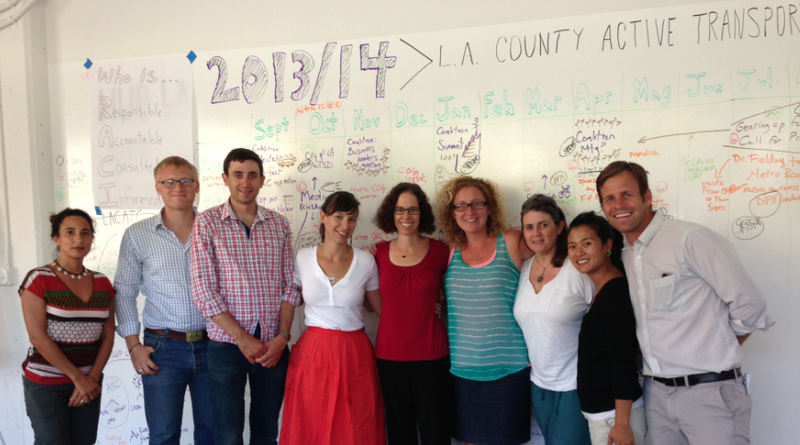 The latest example: Jill Sourial and I recently facilitated a two-retreat for a the LA County Active Transportation Coalition, a project between the Safe Routes to School National Partnership and LA County Bicycle Coalition funded by the LA County Dept. of Public Health. Outside stakeholder phone calls: As we scanned the environment at the start of the retreat, we took an hour to make phone calls to key outside stakeholders as a group. 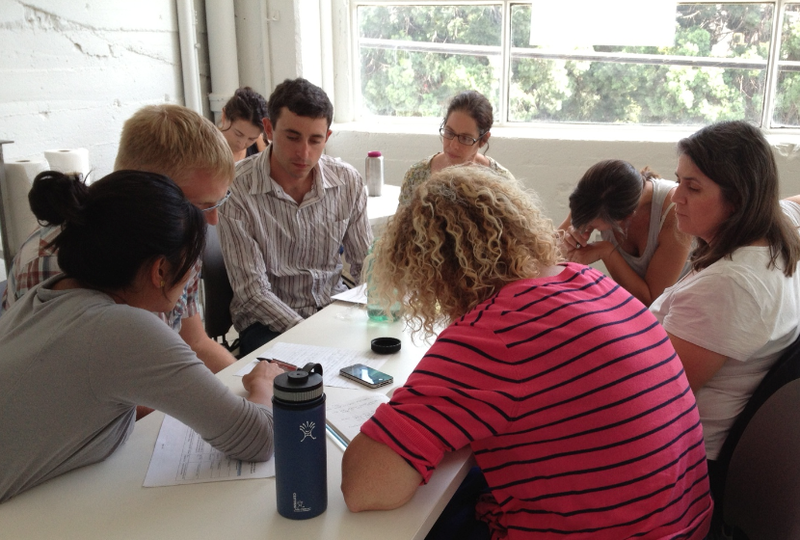 Retreat participants received outside feedback on their work and then took time to reflect on what they heard. 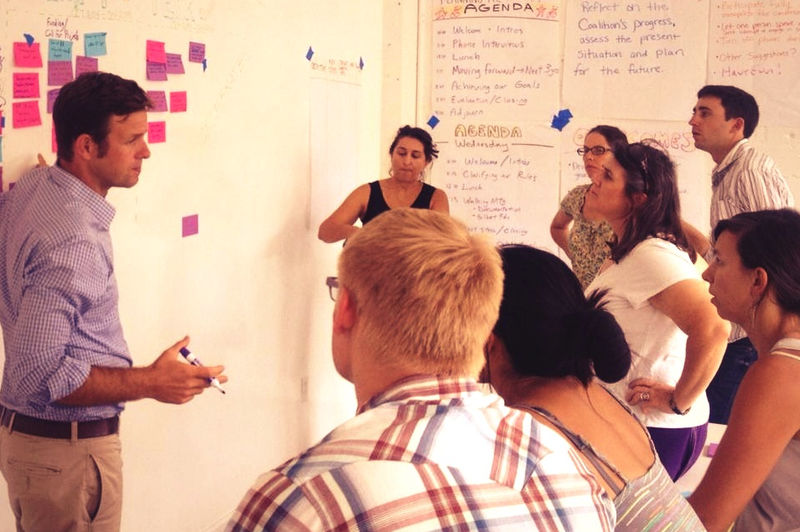 The conversations allowed them to test some ideas and then later refine them at the retreat. Goals for Year 3, 4 and 5: Using the wall that had a special paint on it that made it function as a giant whiteboard, I used it to create three different years in which to plan goals. While I have worked with numerous organizations to develop one-year goals and five-year goals, at this retreat we developed detailed goals for years three, four and five of this grant funded initiative. 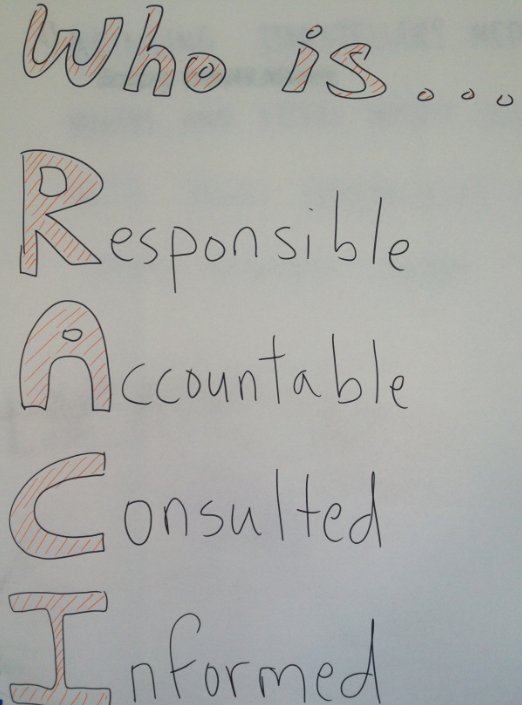 RACI Charting: Once we developed longer-term goals, we turned the conversation to roles and responsibilities. Given the complexity of having multiple organizations working together on a project, I introduced a tool I learned in grad school to clarify who is doing what. This helped us distinguish between multiple people and organizations responsible for implementing goals. Funder as Partner: While I have recently worked with other collaborations where the funder was present (Building Healthy Communities and Green Little Fingers Program), the representatives from the Department of Public Health played a more proactive partner role in supporting National Partnership and the Bike Coalition as they developed their strategy. This partnership approach leveraged everyone’s strengths. As we closed the retreat, I shared with the group how meaningful it was for me to be there and how grateful I am for all of their work. When a small group of us started the Los Angeles County Bicycle Coalition in 1998, we started it because there was no organized voice to advocate for bicycling in Los Angeles County. 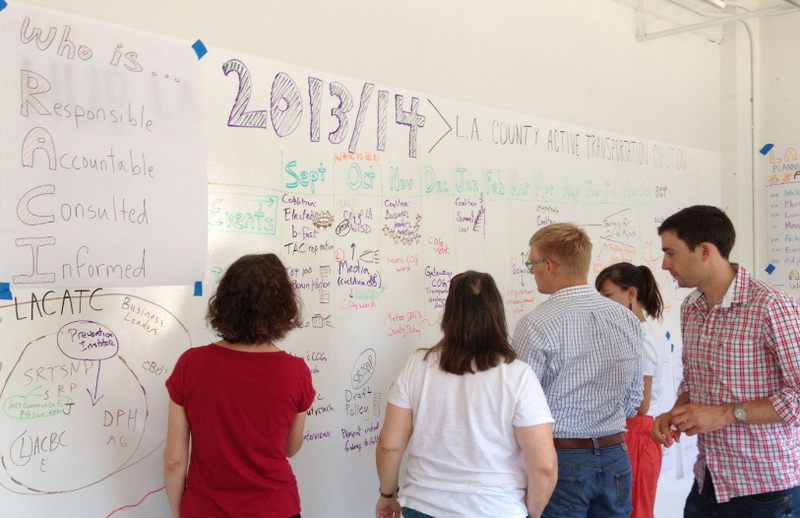 Now, there is a growing bicycle and pedestrian movement involving multiple organizations working for change. The challenge is too big for any one organization to fix on their own. We need collaborations like these to transform our region into a more sustainable, livable place. This entry was posted in Collaboration, Facilitation and tagged #Nonprofit, #NPLA, Clients, Collaboration, Community, Facilitation, Leadership, Retreats, Strategic Planning, Sustainability. Bookmark the permalink.